For bespoke doors & doorsets we have a successful track record of working in partnership with Architects, Designers and Distributors.Talk to us about your projects, we can assist with specification, advise on production times and help keep your project on time and on budget. 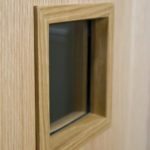 Our aim is to work with you to create compliant and beautifully designed bespoke doors & doorsets. Combining our technical and manufacturing expertise with your creativity ensures clients benefit from the best of both worlds. All our internal doors & doorsets are manufactured to individual client requirements ensuring a product that is unique to you. Our team of experienced estimators will work closely with you during the quotation process to ensure they have fully understood your requirements.